» Will We Ever See Another LT? Will We Ever See Another LT? In today’s NFL, there’s a feeling of impermanence surrounding even the best running backs. The value of the position has diminished to the point that teams that draft backs too high or dole out massive contracts are questioned for it, and the thing is, those questions have some merit. The New York Giants won a Super Bowl in February with the league’s worst rushing offense. Two of the league’s best five backs will be coming back from torn ACLs this season. Another took home $30 million guaranteed last offseason before falling off the face of the earth. With every 5,000-yard passer and every running back by committee, there’s an increased fragility in the lifespan of truly dominant backs. That’s why today, as LaDainian Tomlinson ends an unbelievable 11-year career, it feels like an era is ending with it. That 2006 season — in which the rushing touchdown total would end at a record 28 and the yards at a career-high 1,815 — is the one that still stands out. The Chargers were a league-best 14-2 and Tomlinson was the best player in football by a landslide. Even in San Diego’s Divisional Round loss against New England, the game that marked the end of coach Marty Schottenheimer’s tenure with the Chargers, LT gashed the Patriots for 123 yards and two touchdowns on 23 carries. In all, it was one of the best seasons in NFL history, but the lasting memory is how easy it all looked. Ripping off 40-yard runs became routine. (He had at least one in seven games.) He was truly a threat to score every time he touched the ball, and from anywhere on the field. Near the goal line, it became automatic. I’m not sure I ever saw a player do so much with so little space. I’m not sure I ever will again. 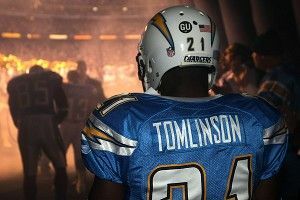 In defining where Tomlinson ranks historically, it’s probably easiest to start with the certainties: (1) He’s a first-ballot Hall-of-Famer, (2) he ranks among the two or three best Chargers ever, and (3) he and Marshall Faulk are the two best backs of the past 15 years. There’s a debate to be had about who was better and for how long, and the interesting part is in how similar both were. Faulk is probably considered the best receiving running back of all time, and Tomlinson falls in right behind him. From 1998 to 2002, Faulk had at least 80 catches a season, including the Rams’ Super Bowl season, in which he finished with more than 1,000 receiving yards and 2,429 yards from scrimmage. Tomlinson’s biggest year through the air came in 2003 when he added 100 catches to go along with his 1,600 rushing yards. In the end, Tomlinson got to the end zone 26 more times, and Faulk had about 700 more yards from scrimmage. What is clear is that any conversation about the epitome of a passing era running back starts and ends with those two. For my money, I’d take Tomlinson. It starts with the touchdowns, but it ends with what was asked of him. Faulk played in a dome, for Mike Martz, in an offense with a Hall of Fame quarterback and two Hall of Fame receivers. Tomlinson’s MVP season came with a first-year quarterback and an offense whose best wide receiver was Eric Parker. As running backs become increasingly disposable, that’s what will always make Tomlinson’s career stand out. LT had to be everything for San Diego, and most of the time, he was.